Ngoya Etix DC (Ghana) Limited – The Joint Venture between Etix Everywhere, Ngoya and Africa Investment Group (AIG) announced the start of the construction of a Tier IV data center in Accra, Ghana. This multi-tenant data center (MTDC) will be carrier and vendor neutral. 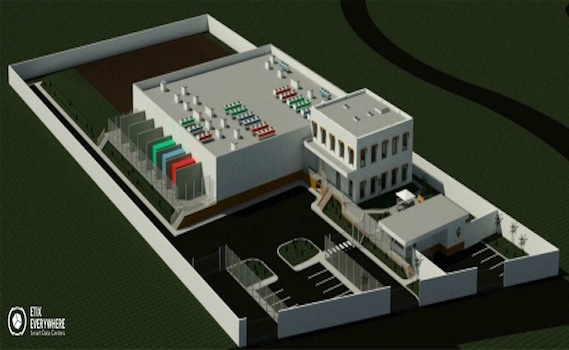 Etix Accra #1 will be the first Tier IV data center in West Africa. The Tier certification from the Uptime Institute guarantees to customers an infrastructure, a capacity, and processes in place to provide a truly maximum level of availability. “Due to the unpredictable nature of African power utilities and to secure an uninterruptible power supply for the data center, Etix Everywhere proposed to build a solar plant next to the data center”, says Ross Macdonald, CEO of Ngoya. “The infrastructure will be able to support the data center at full capacity.” The solar plant will be built and operated by Etix Energy, a subsidiary of Etix Group. Based on the modular design developed by Etix Everywhere, the first phase of the project will offer a capacity of 150 racks. Over half of the first phase is already booked. Due to the increasing demand for carrier neutral colocation services, the Joint Venture is planning to build a second site in Ghana to provide full redundancy. This data center marks the next phase of Etix Everywhere’s expansion throughout Africa. “We are building a global network of colocation data centers so that our customers get access to the best infrastructure wherever it is needed,” explains Antoine Boniface, Managing Director of Etix Everywhere. Etix Accra #1 will be the second data center of Etix Everywhere located on the African continent, after Etix Casablanca #1. Ghana is a vibrant West African economy which is well supplied with submarine cables, mobile network operators and ISPs and strategically situated to provide a stepping stone into the region.